Published April 1, 2015 By Anna T. This post may contain affiliate links. Regardless, I only recommend sites I've researched and/or used and trust. If you're someone who wants flexible work that doesn't necessarily have to take place at your home, you may be interested in all these new services I'm coming across that hire people to run various types of errands for others. You can actually get paid to do things like shop for groceries, deliver restaurant food, give people rides, and all kinds of other little tasks. These types of companies would be ideal to look into if you need something to do on the side and if you live in or near a large city with lots of people who may need these tasks done for them. And yes, that is the big downside to these types of opportunities. With pretty much ALL of them, availability is limited to specific cities, and for the most part it's big cities. I've made an effort to include what cities each service is available in where that info was available. Uber has been doing some heavy advertising over the past year, trying to get people to sign up as independent contractors for their ride-sharing service. You can work for them and earn extra money acting as kind of a “personal taxi” for people who need rides. Once accepted as a driver, Uber allows you the freedom of working whenever you want and picking and choosing the jobs you want to take. So how much do Uber drivers actually earn? Uber claims that their drivers earn more than your average cabbie, but this write-up on Money provides a little more insight, concluding that Uber drivers probably make at least as much as cabbies, but likely not a ton more. Unlike many of the other services I've listed, Uber is open to more people geographically, including in other countries besides just the US. You can go here for a full list of cities where Uber hires drivers. Another way to get paid by Uber is to start delivering food! Uber Eats is growing quickly and is currently available in more than 70 cities. You just install the app and then pick orders to deliver in your area, on your own time. And better yet, you can do this using a bike, car, or scooter so you have more options than you do with Uber's ride-share service. You can also drive an older model car, something that isn't allowed with regular Uber. Most Uber Eats drivers earn between $10 and $20 hourly. Go here to sign up, or read our full Uber Eats review first to see if you think this is for you. This is a service very similar to Uber where you can get paid to drive people who request rides in your area through the Lyft smartphone app. Lyft allows you to keep your tips, plus you get paid for each trip on a per minute and per mile basis. Payments are made either weekly or daily (with Express Pay). Go here to learn more about driving for Lyft. Postmates is an app people can download to request a delivery at their home from any store or restaurant in their cities. Currently it's available in many geographic areas nationwide. You can apply to be a driver for Postmates and earn the majority of the delivery fee Postmates charges, plus 100 percent of the tip. This equates to about $25 an hour for most Postmates drivers according to their site, although I found a review on Glassdoor where a driver stated that $12 hourly is closer to realistic. TechCrunch also has an interesting write-up on someone who ran deliveries for Postmates for one day. Currently you can become a Postmates driver if you live in or near San Francisco Bay Area (San Francisco, East Bay, South Bay), New York City, Chicago, Los Angeles, Washington DC, Seattle, Austin, Boston, Philadelphia, Miami, San Diego, Denver, Las Vegas and Orange County. They hope to expand to more cities soon. You can sign up as a “tasker” and Task Rabbit will show you the job opportunities available in your area that might interest you. The service is currently available in 19 different cities nationwide. 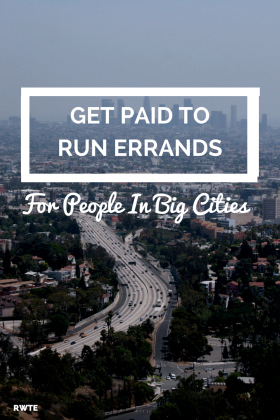 You can get paid for doing everything from house-cleaning to grocery shopping for people in your area. TaskRabbit pays you directly via their online payment system right after tasks are completed. You are free to set your own rates for specific types of jobs. Most people charge anywhere from $25 to $150 hourly, and some people are actually earning anywhere from $2,000 to $7,000 per month working for Task Rabbit full-time. Currently Task Rabbits operate in Atlanta, Austin, Boston, Chicago, Dallas, Denver, Houston, LA & OC, London, Miami, NYC, Philadelphia, Phoenix, Portland, San Antonio, San Diego, Seattle, SF Bay area, and Washington, DC. This company specializes in grocery delivery. You can apply to be a shopper and earn up to $25 hourly buying and delivering groceries to people who have signed up for the service. It's currently available in about 15 major cities nationwide. If you want more details on what the job is like, Huffington Post has some first-hand accounts from actual Instacart delivery workers. This page has a map of all the different Instacart delivery areas, and it's limited so far to primarily major cities nationwide. You can also go here to read our review of Instacart to learn more. Similar to Postmates (above), DoorDash lets you set your own hours, delivering restaurant food to people who want it brought to them. They claim you can earn up to $20 hourly. Want to know what it's like to be a DoorDash driver? The Work at Home Wife has an insightful interview posted with an actual DoorDash driver that provides a lot of detail on how things work there. DoorDash is currently operating in San Francisco, Silicon Valley, Los Angeles, Boston, Chicago, Washington DC, and Brooklyn, so you'd need to live near or in one of those cities in order to do this. Be sure to read our DoorDash review for more details on how it all works! Good luck if you decide to sign up for any of the above sites! Most of my ads are through ad networks (Adsense, etc.) If you start a blog, just wait until it’s about 2 or 3 months old and then apply to join an ad network. Then, they will give you the code you need to install ads on your blog. You can also sell advertising directly. I am so glad that you’ve included these!! 🙂 I just moved to Seattle and as I said before in another post, my wah job uses a lot of these services for things that need to be delivered asap. We haven’t had a problem with any of the services and our users are happy when they receive their item. We are looking to get a car out here so hopefully I can get a part time job with the ones in my area (plus, it will help with getting to know the area more since we’ve never been on the West Coast before). Thanks again Anna! Great post! Good luck! For sure stop back by and let us know how it’s going if you do end up working for any of these companies.